School’s been back in session here for about a month — and you know what that means… Well, besides the fact that my house is eerily quiet, it means the weeknight dinner dash is ON! Our after school hours are packed with sports and homework, so getting a healthy dinner (that everyone will actually eat) on the table quickly is essential. To be honest, there are many, MANY evenings where I don’t even start dinner until after 7:30, so quick, easy, and delicious is absolutely the name of the game. 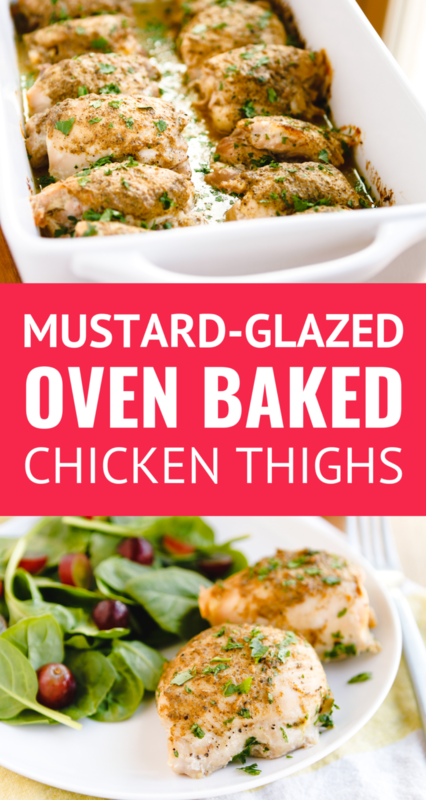 Mustard-glazed oven baked chicken thighs to the rescue! 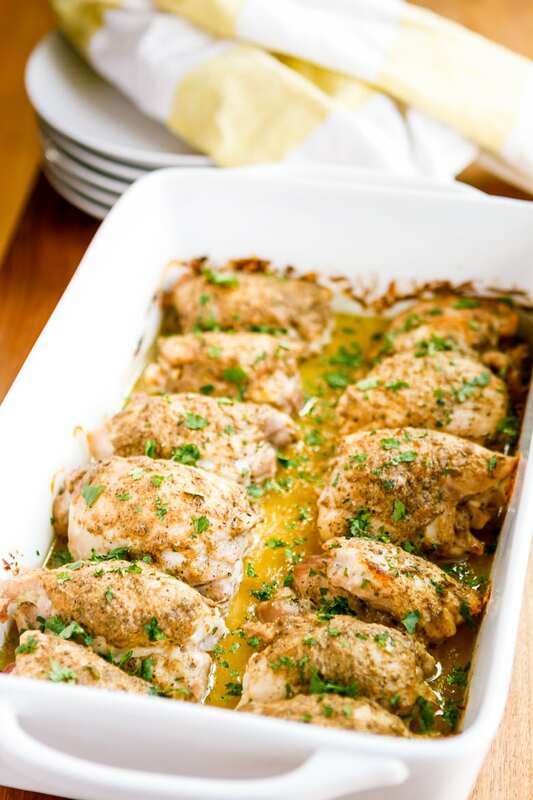 Truly, I can’t believe that I haven’t shared this easy boneless skinless baked chicken thighs recipe before. It’s one of our FAVORITE dishes, so I make it at least every other week. My boys absolutely devour them, and the best part is they can be ready in just over 30 minutes. Really! 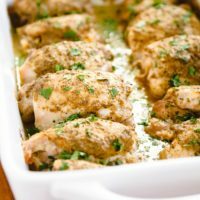 Now, I have a feeling that some of you might be a little on the fence about chicken thighs… For years we’ve been hearing that white meat (like chicken breasts) is the way to go. But here’s why you should give them a try: FLAVOR! Dark meat chicken is ever so much more flavorful and tender than boneless skinless chicken breasts. You may be under the impression that chicken thighs are fatty and greasy, but it’s the skin that contains most of the fat. I use the Harvestland Boneless Skinless Chicken Thighs from Walmart, so there’s no fatty skin and the rest of the fat will cook off when baking. See? Nothing to be scared of at. all. But on the other hand, chicken thighs with the skin on are also perfectly healthy. 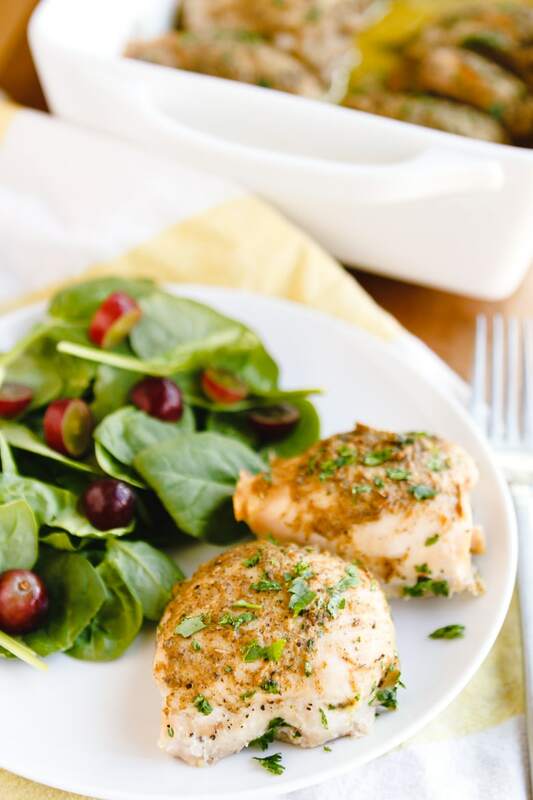 If you’ve been searching for a recipe for delicious keto chicken thighs, you can totally make this recipe with skin-on chicken thighs. I’ve even made it with bone-in, skin-on chicken thighs. The results are always stellar! This simple mustard glaze is SO delicious! All you need are melted coconut oil, Dijon mustard, and poultry seasoning — plus a touch of salt and pepper. 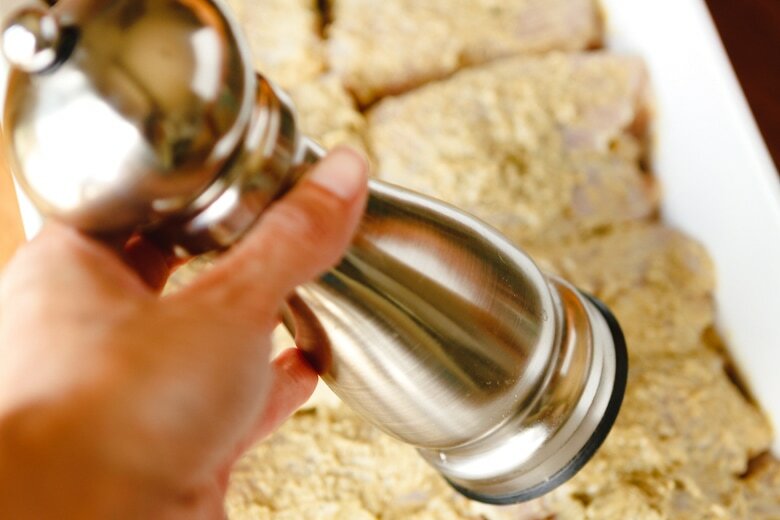 Stir them all together, and brush the mixture on your chicken thighs. TIP: If your coconut oil is solid, simply measure it out into a small mixing bowl and set it in the oven for a few minutes while it’s preheating. Once it’s mostly melted, you can stir it to melt any remaining chunks and whisk in the rest of the ingredients! 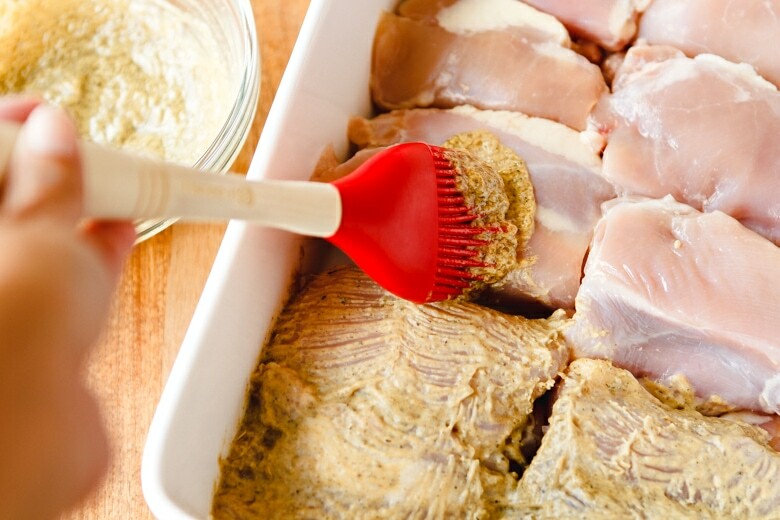 After packing the chicken thighs into a 9×13″ ceramic baking dish, I use a silicone basting brush to coat them with the mustard glaze, give them a small dose of freshly cracked black pepper, and bake. Seriously, THAT’S IT! Just 6 simple ingredients — or actually 4 if you don’t count the salt & pepper, since those are universally considered pantry staples. If you’re wondering how long to bake chicken thighs in the oven, the average is about 30 minutes. Bone-in or boneless should not affect the cooking time wildly. But if you really want to be sure your chicken thighs are perfectly cooked, I cannot recommend this digital meat thermometer enough. Insert it into the center of one of the chicken thighs, and when it reads 165 degrees, you can be certain they’re done to perfection. I use my meat thermometer every. single. day. I even took it on vacation with us this year! And then I forgot to bring it home, so I ordered a new one the same day we returned home. GET ONE, you won’t regret it! This really is the BEST chicken thigh recipe… I hope you’ll try it and let me know what you think! And if you need some suggestions for easy side dishes to pair with it, keep reading after the recipe. PIN IT NOW! CLICK HERE TO ADD THIS BAKED BONELESS CHICKEN THIGHS RECIPE TO YOUR CHICKEN RECIPES BOARD ON PINTEREST! 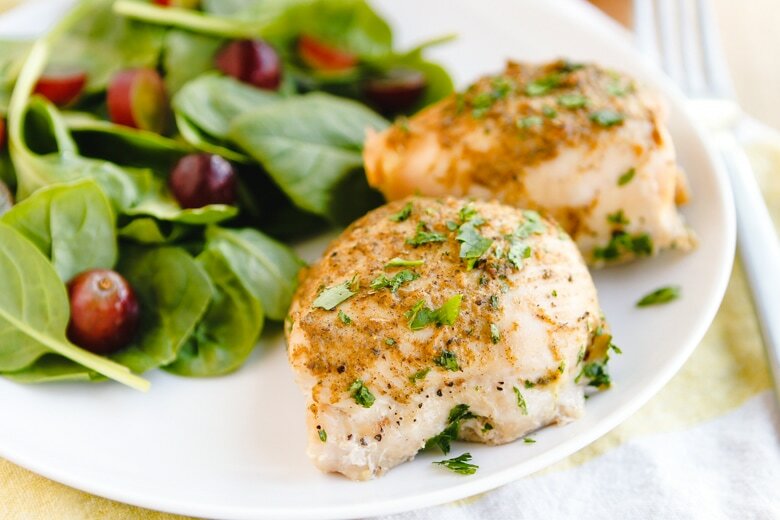 With just 4 ingredients and only 30-minutes of baking, these amazing baked boneless skinless chicken thighs are sure to become a weeknight staple. Winner, winner, chicken dinner! 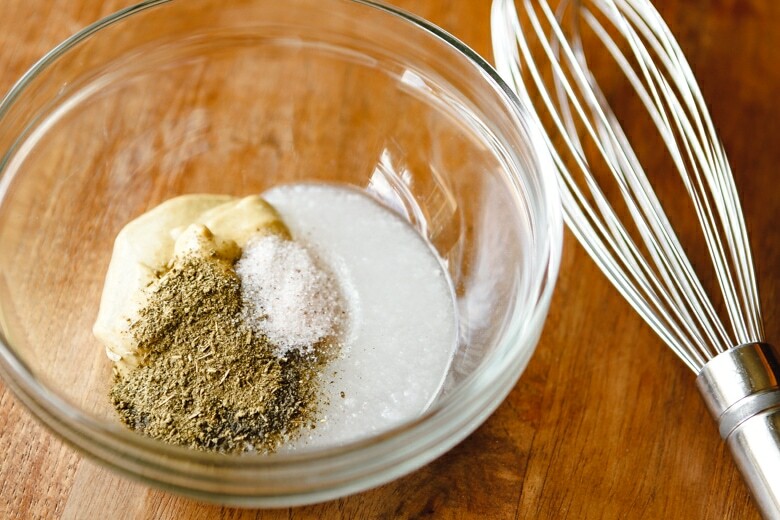 In a small mixing bowl, whisk together the coconut oil, Dijon mustard, poultry seasoning, and salt. 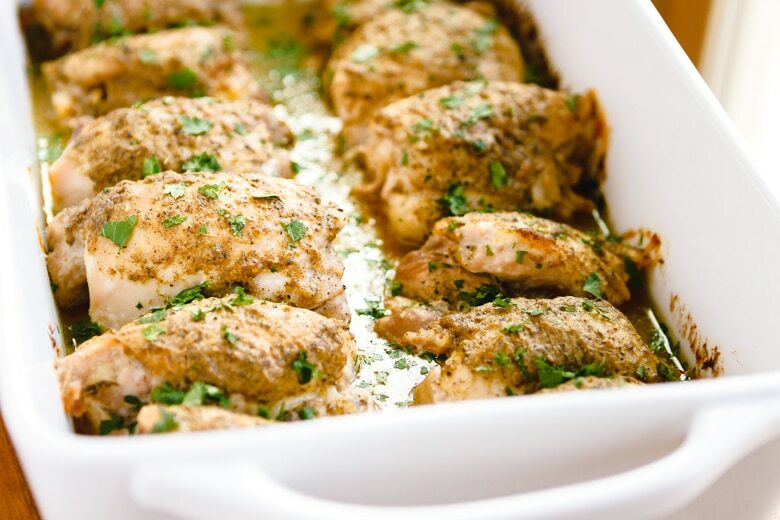 Arrange the chicken thighs in a 9x13” baking dish. Brush the mustard glaze mixture evenly over the top of each thigh. Add freshly ground black pepper to taste. Bake uncovered for 30 minutes or until a meat thermometer reads 165 degrees when inserted into the center of one of the chicken thighs. Make double batches of grains — When I make grain sides, like coconut milk rice or coconut lime quinoa, I prepare a double batch so I can just reheat the leftovers for a second meal later in the week. Keep prepped fresh veggies on hand — Taking a few minutes early in the week to cut up fresh bell peppers, carrots, celery, green beans, etc. shaves precious minutes off of meal prep later on. I can serve them paired with a dip in a pinch or toss them with some olive oil, salt, and pepper and pop them in the oven with the chicken for an easy roasted veggie side. Toss a simple salad — I’ve found that the key to getting my kids to eat more greens is to add a generous serving of fruit to our salads. Grapes, strawberries, mandarin oranges, and blueberries always go over well, and they taste great drizzled with a simple vinaigrette. I’d love to see how your baked boneless chicken thighs turn out… Tag me @Unsophisticook on Instagram or use the hashtag #Unsophisticook so I can check it out. Enjoy! Would this work if I prepped the thighs & froze to cook later? And would this recipe cook well in an instapot? Hi Bonnie! You can prep it ahead and freeze it to make later, but I do recommend thawing and then baking instead of baking them from frozen. I’m sure you could make it in the Instant Pot, but I recommend baking for best results. I once tried baking it covered with foil, and they were not nearly as good. The sauce slides off and they bake too quickly. I love me some spicy mustard so I know this would go over well! I also love how it’s such an easy weeknight recipe! Oh my goodness these sound amazing and nothing beats a 30 minute dinner! Thanks for sharing! We all need more easy flavourful recipes like this one! We have chicken quite often and this is such a great way to change up our usual routine. Loving the flavors! This recipe looks quick and easy, however, I am allergic to coconut. Could I substitute butter instead? Hi Cindy! I’m sure butter would substitute just fine, or you might also consider ghee or avocado oil to make it a little less rich. My children are somewhat picky eaters, especially when it comes to things like chicken breasts over chicken nuggets. However, this looks simple enough to make and like something they just might eat. Maybe worth giving a try. We’ll see. What a fantastic marinade! I love that these are simple ingredients that I pretty much always have on-hand! Thanks for a great recipe! I love how easy this is to make! Mealtimes have been rather hectic around here too, but this is sure to please. The marinade looks delicious. I love any marinades that include dijon! Can’t wait to try this! These were delicious! They will definitely be a regular on our meal plan! This is such a great recipe! I love the combination of flavors. So yummy! I loved that this recipe only had 5 ingredients, all of which I had in my kitchen already! Oh I sure do love tasty dishes like these that require minimal ingredients and cooking time. They sound delicious. Will definitely make them for my family soon. Isn’t it amazing when just a few ingredients can result in such a divine dish! Love it. LOVE thighs and this looks so quick and easy. Can’t wait to try! This is so simple but the mustard glaze really kicks up the flavor! Thanks! This recipe will be on repeat at my house for great weeknight dinners! it is so busy now that school and activities are back in session. The actual recipe with ingredients is not showing up. Can you tell how much of each ingredient please? Can’t wait to try this. Thanks! Thanks for letting me know about this, Jennifer! It should be working now. Hope you love it! Yep it is! Thank you so much!